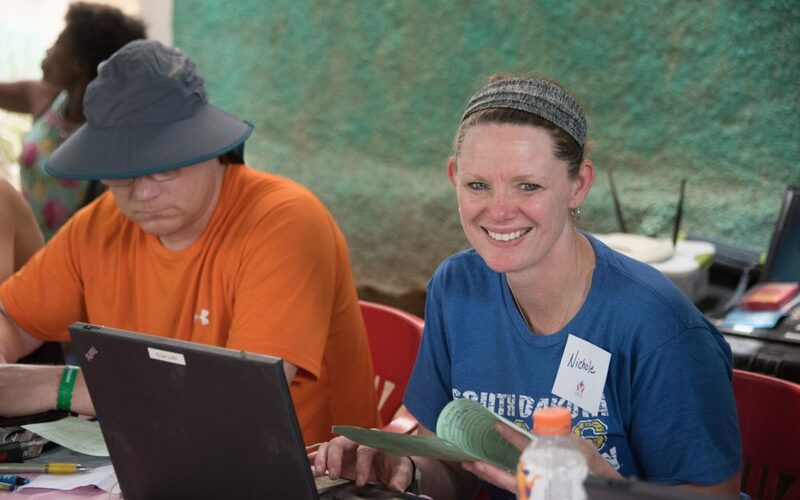 In June, Cutler Law Firm Partner Nichole Mohning spent a week volunteering with Community Health Initiative (CHI) Haiti. Nichole was part of a team of volunteers compromised of medical providers and non-medical volunteers from across the United States as well as Haitian doctors and staff. The team conducted medical clinics in the villages of Do Digue and Fondol which are located about an hour northwest of Port-au-Prince. CHI is a nonprofit organization based out of Coralville, Iowa with a mission of partnering with the rural Haitian communities to identify needs and implement solutions. Along with providing continuous primary health care by conducting several medical and surgical clinics each year in these villages, CHI has assisted with water treatment, latrines and recycling programs. Mohning primarily assisted with obtaining medical histories from the patients and entering data in the electronic medical records system. The non-medical volunteers were also trained to assist in performing basic treatment such as conducting blood sugar and lab tests, taking blood pressures and giving injections. The team saw nearly 1,700 patients over five days. “I was honored to be a part of such a dedicated and talented group of doctors, nurses, volunteers and staff from the United States and Haiti. It was amazing to see the level of care being provided in the most basic of environments. The area we worked in was incredibly beautiful, yet tough given the terrain and poverty. The people of this region are equally beautiful and tough. It was a privilege to get to know and work with them,” said Mohning. What is so rewarding about working with CHI is its mission to work with people in the communities to create the infrastructure and tools necessary for them to provide for themselves. It is a partnership with the goal to not be needed. While the circumstances are certainly very different, its mission is similar to how Mohning approaches her relationship with clients. Mohning works proactively with employers to identify needs and risks and jointly design and implement solutions with the goal that legal counsel will not be needed to defend claims at a later date. Mohning joined Cutler Law Firm in 2008 and practices primarily in the area of employment law. Cutler Law Firm, LLP is a full-service law firm based in downtown Sioux Falls. Photo courtesy of Tony Mancuso.